Nimsay's niche is in autumn's hues and asperous wings. Nimsay is the beautiful protectress of the flying elf horses. It is near her that the most precious of elf animals have their grazing place. 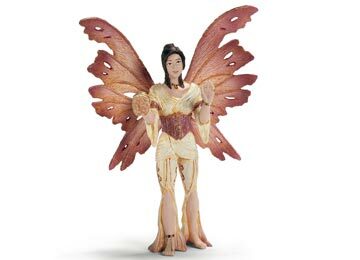 Nimsay is clothed in shades of cream and earth and her wings resemble highly pinnate autumn leaves. In her hand, she holds the brush with which she lovingly grooms all horses on a daily basis. She loves all horses and all horses love her because Nimsay knows what is good for the animals, just like you do.